Salford's final Super League match of 2012 against Wakefield on Saturday will be played at another venue as Sale are using the Salford City Stadium. The Reds' game, which was originally scheduled for Friday evening, has been selected for live television coverage and will kick off at 18:15 BST. It now clashes with Sale's Premiership fixture against Saracens, their first competitive game at their new home. 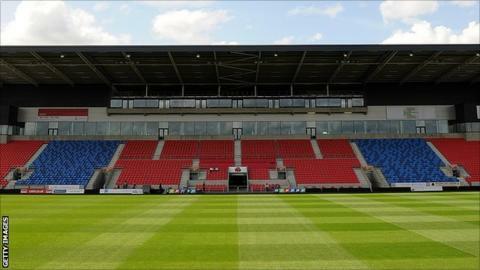 Salford's game will now be played at Leigh Sports Village. "I don't think anybody would be happy about having to play a home game on another ground but it's out of our hands," said Reds football director Steve Simms. "We have to move everything, sponsorship boards, everything, and it's a massive job. It's going to take a lot of work by a lot of people." Super League club Salford moved into the new stadium at the start of the season and have been playing the majority of their home fixtures on Friday evenings. The Reds and Sale announced their groundshare in April. The Sharks had been playing their home matches at Edgeley Park, home of Blue Square Bet Premier football club Stockport County.